It’s what all SEO firms are trying to figure out. All you have to do is produce interesting, thought provoking, compelling, seducing, enticing, engaging, captivating content and you will get found. Before you go vomiting content for the sake of filling your project list, there are three steps to take before pen hits paper (yeah, I know…more like fingertips to keys). Step #1: Why are you writing this piece? What’s the goal? Don’t get me wrong…Kerouac’s style of stream of consciousness writing where you let the mind wander is good for the soul but not so for the brand. Get a clear cut idea of where you want to end…then you will find your direction. Step #2: Who are you writing for? You speak differently when you are talking to your grandma then when you are talking to your kids, right? You need to write the same way. There needs to be a chameleon-like quality to your writing. Move the bow slightly so the arrow can hit the target. Step #3: Go into the piece prepared to break the rules. If you want all of the adjectives to apply that I alluded to earlier…you have to not only think outside of the box, but you have to rip the box apart altogether. 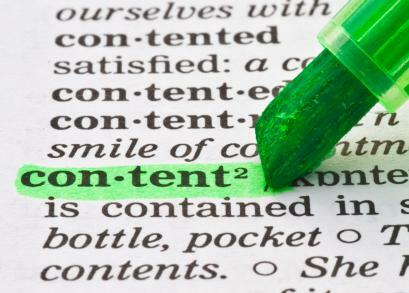 If you do these things, content marketing becomes easier and you will have all of the adjectives you need.